Hurricane Sandy has been downgraded to a post-cyclone storm, and most of the devastating effects of the hurricane are past, but people in 22 states in the USA are still dealing with the effects of its landfall. Hurricane Sandy grew big enough to become an awesome visual spectacle even from space, growing to an enormous mass of wind that stretched nearly 1,100 miles across. The image above was captured by NOAA’s GOES-13 satellite on October 28th, at 9:02AM EDT. Sandy is a huge, swirly mass, centered just off the eastern coast of the United States, merging with a cold front on its western edge. As the largest hurricane on record, Hurricane Sandy is a late-season tropical cyclone that affected the Greater Antilles, the Bahamas, and Eastern Canada as well as the Eastern USA. It’s the 10th hurricane of the 2012 Atlantic hurricane season and it developed from a tropical wave in the western Caribbean on October 21. It became a tropical depression that quickly strengthened into a tropical storm. Sandy was upgraded to a hurricane on October 24, before making landfall in Jamaica. 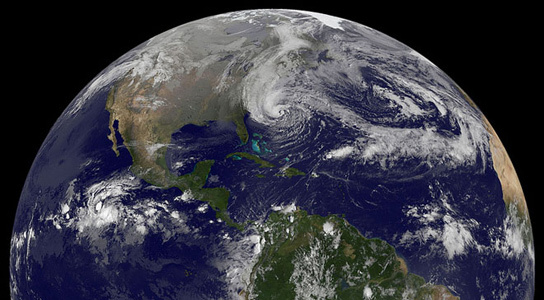 In the early morning of October 25, Sandy became a Category 2 hurricane. 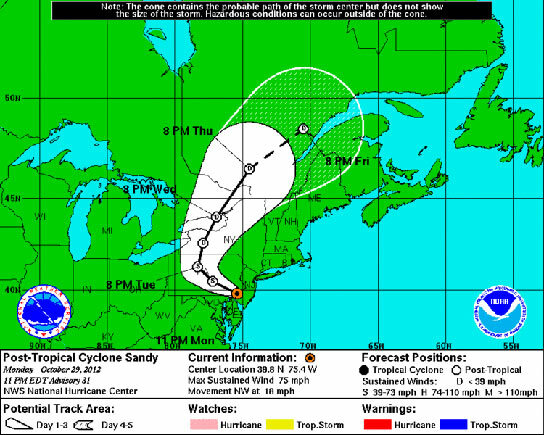 Sandy approached the US coast maintaining Category 1 strength and made landfall on October 29 at 8PM. El Niño Continues to Grow, Set to Bear Down on U.S.
Be the first to comment on "Hurricane Sandy Viewed from Space"